What if I told you there was a way you could get rid of pain, you could increase your flexibility, lose weight, have a peaceful countenance, sleep with no problems, get rid of stress and that it was free for the asking. What if I told you millions of people know what that is and that all cultures and types of people have experienced what that is? Would you believe me? Well, my book Yoga Meditation and Spiritual Growth for the African American Community is such a method. 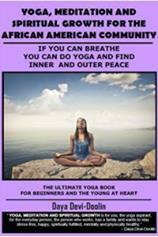 My book isn’t free but Yoga is free, for you. I’ve been practicing and teaching yoga for fifty plus years and I have put my knowledge, experience and enthusiasm for this ancient art into this Ultimate book on yoga for the everyday person. I have recognized that the African American community has not been served as much as it could be and could have been. www.amberbooks.com; www.amazon.com; and amazon kindle and our site www.padaran.com.